You must be eighteen (18) years old or older; reside in or near District boundaries; possess a valid Missouri driverís license, and have a good driving record. You must be in good health and able to participate in activities that require physical exertion. HOW DO I GET TO BE A VOLUNTEER FIREFIGHTER? Call or stop by our headquarters at 215 Hwy. O in Laurie, phone 573-374-4442 for an application or download an application from this web site. Return the completed application to our district office. A background check is conducted. Following the completion of the background check, you will be called to a meeting with Department Officers. Your application will then undergo final review and upon approval, you will begin basic training and be issued equipment necessary to perform assigned duties. All recruit firefighters are subject to a probation period of a minimum of six (6) months. 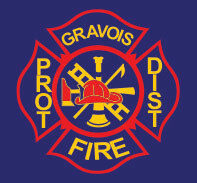 During your probation, you will complete a basic firefighter training course, receive training on emergency vehicle driving, apparatus operation and department policies and procedures necessary to perform your duties as a firefighter. There is a series of training objectives you must accomplish during your probation. Upon completion of all probationary firefighter objectives, your performance will be reviewed and with the approval of the officers, you will be promoted to firefighter. ARE VOLUNTEER FIREFIGHTERS PAID OR RECEIVE ANY COMPENSATION? There is a pay per run program for all volunteer firefighters. Each emergency response, training meeting, drill and special detail that each volunteer firefighter makes is worth one point. Each point has a cash value and in December each year checks are issued for points earned that year. All equipment necessary to perform assigned duties including protective clothing for firefighting, uniforms, radio receiving equipment and equipment and vaccinations for protection from infective diseases. In house training, under the supervision of a state certified fire service instructors and all course costs and lodging along with a stipend to help cover transportation and meals when attending approved training out of the District. Membership with the Firefighters Association of Missouri along with $15,000.00 of accidental death insurance. Meetings & Training are on Thursday nights beginning at 6:30 pm. Work sessions, drills, special details or work assignments are scheduled as required. Our EMS Team and other special service units have their own requirements for membership and participation and hold training meetings with the time and location announced in advance. Other training sessions are held through the year for specific training subjects.